Flash from the Past: Southern Region Slamdoor EMUs at Herne Hill, London. I exposed this vintage Fujichrome colour slide using a Nikon N90s in March 1999. My reason for selecting Herne Hill was to picture the Eurostar in third rail territory on its run from Waterloo International to the Channel Tunnel. Catching this suburban train as it passed the junction was just happen-stance. The old slam door cars are now more than a decade gone from revenue working, and to me this photo seems like a long time ago. Typically, Tracking the Light posts daily. London St Pancras Station on 3 May 2016. On this day two years ago (3 May 2016), I spent the morning photographing London’s St. Pancras Station. The old terminal of the Midland Railway is my favorite London Station, and among the most influential railway stations in Britain. I’ve featured this station in a number of books, including Depots, Stations & Terminals published by Voyageur Press in 2015, and my new Railway Guide to Europe, now available from Kalmbach Publishing. These photos were exposed digitally using my FujiFilm X-T1. Although I exposed the images in RAW and JPG, all of these images represent the colour and contrast of the in-camera JPG with Fujifilm colour profile. London St Pancras on 3 May 2016. Exposed with a FujiFilm X-T1 fitted with 18-135mm Fujinon zoom lens. London St. Pancras. Exposed digitally using a FujiFilm X-T1 with Zeiss 12mm Touit. On this day two years ago, I was photographing in London. My father and I had arrived via the Channel Tunnel on the Eurostar on the previous day. It was a bright morning and I made good use of my Lumix LX7, photographing London stations and trains as I explored the Overground network that follows an orbital route around the city. London Victoria on 1 May 2016. Lumix LX7 photo. 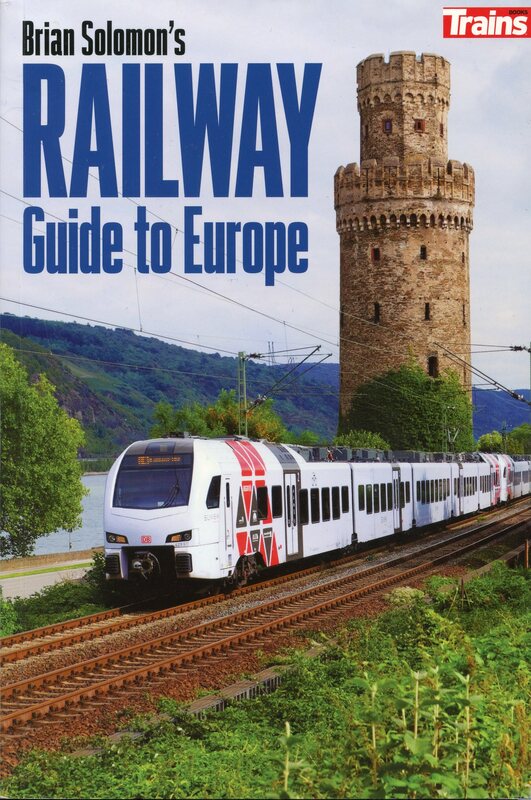 London is a great place to explore by rail and among the featured cities in my new Railway Guide to Europe published by Kalmbach Publishing. Old Gatwick Express at Clapham Common. To improve this image, I’ve cropped distracting and unsightly elements (boxes and graffiti) from the left and the right hand sides of the frame. Exposed on Fujichrome and scanned with a Nikon LS-5000. 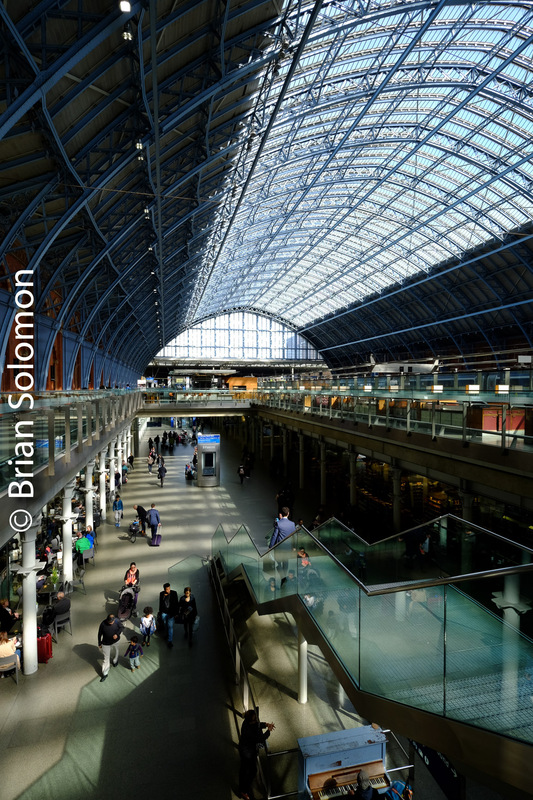 On 25 March 2007, Hassard Stacpoole and I were photographing the evolving British railway scene in the London area. Among our subjects for the day were the specially styled Gatwick Express class 460 Juniper train sets, such as this one, and Eurostar trains working via 3rd rail and serving London Waterloo International. While the core of old Gatwick trains still exist, the distinctive styling was removed. We knew then that both services would eventually change. The Gatwicks services were re-equipped while the Eurostar was routed into St. Pancras. Tracking the Light presents: London Terminals—May 2016; a Dozen new Photos. 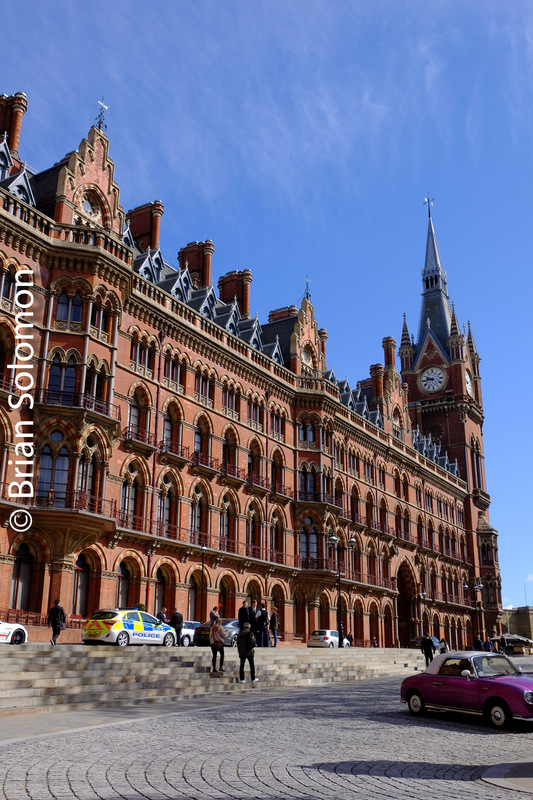 London boasts some of the most historic and most famous big city railway terminals. Earlier this month I visited several of these stations during the course of my travels. Soon Euston may be dramatically redeveloped. Yet, owing to its 1960s design, this terminal may be among the least photographed in modern times. FujiFilm X-T1 photo, May 2016. Departure boards at London Euston in May 2016. FujiFilm X-T1 photo, May 2016. 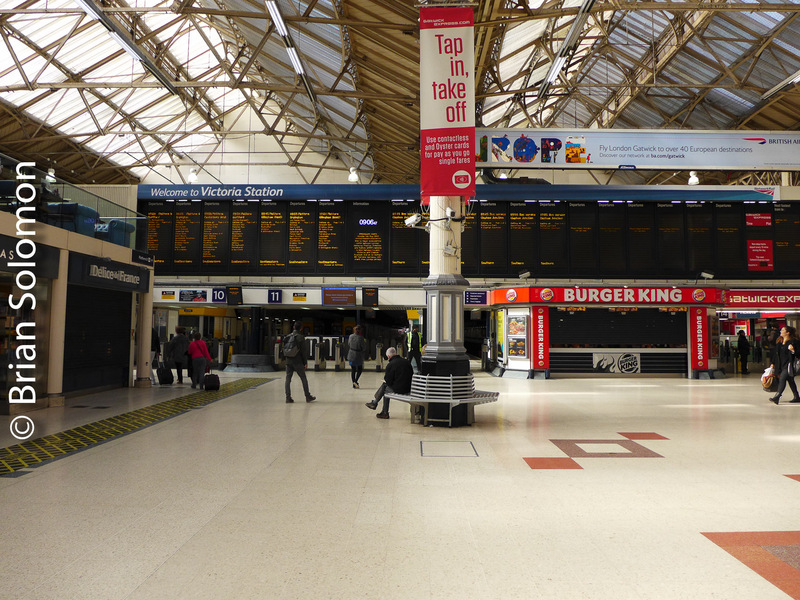 Hassard Stacpoole brought me on a tour of London’s 1960-era Euston Station to show me sites of anticipated changes to this busy terminus as result of its planned redevelopment. My favorite London station is St. Pancras. Which is yours? 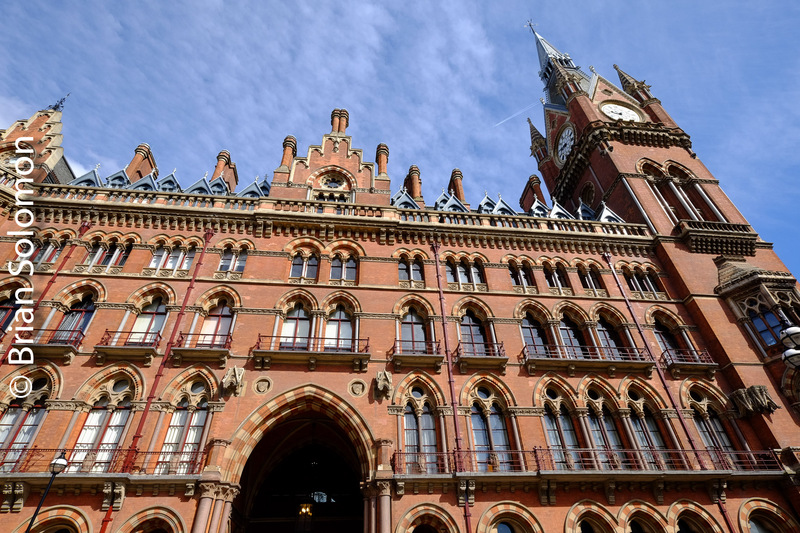 The most elegant and ornate London terminus is St. Pancras. The head house originally served as the Midland Grand Hotel as well as booking offices. Today the grand old building is again a hotel, while the station serves Eurostar trains to Paris, Lille and Brussels as well as domestic services using the old Midland route. FujiFilm X-T1 photo with Zeiss 12mm lens, May 2016. St. Pancras train shed was restored during redevelopment in 2007. FujiFilm X-T1 photo with 12mm Zeiss lens, May 2016. Kings Cross, London, May 2016. Lumix LX7 photo. Grand Central train at Kings Cross, London, May 2016. Lumix LX7 photo. Statue of Isambard K. Brunel at Paddington Station, London. Lumix LX7 photo. Paddington Station, London. Lumix LX7 photo. London Victoria on a quiet Sunday morning. Lumix LX7 photo. I feature several of London’s stations in my recent book Railway Depots, Stations and Terminals published last year by Voyageur Press. All Change! Photographing trains and Clapham Junction and Vicinity—May 2016. On my visit to London earlier this month, I called into Clapham Junction to visit with my friend Hassard Stacpoole who lives nearby. 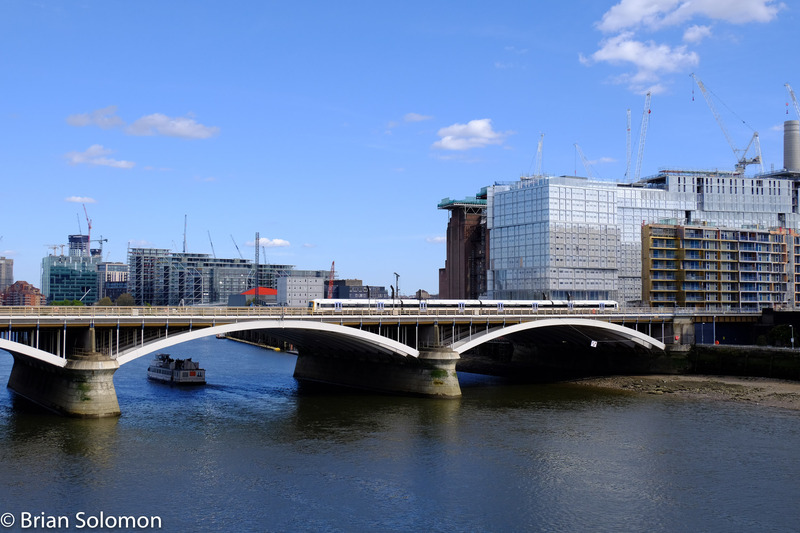 Hassard brought me on a tour of the area to highlight the changes south of the Thames since my last visit. London is a dynamic city. There are cranes and construction sites everywhere you look. The area around Battersea Park is rapidly being transformed from an old industrial area to a modern residential community. Using my FujiFilm X-T1 and Lumix LX7, I made these photos from our tour of the area. 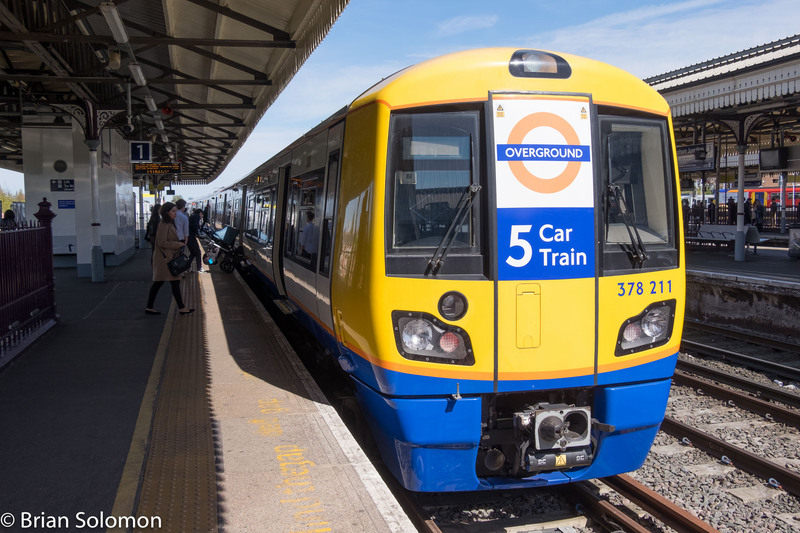 Five car Overground trains now serve Clapham Junction. My intention is to compare these images with similar views exposed years ago, as well as photos showing further change from my next visit. FujiFilm X-T1 digital photograph at Clapham Junction. Wandsworth Road looking toward Battersea Park. Construction now dominates this horizon. The old Battersea Park Generating Station is being repurposed. Massive modern apartment blocks have sprung up around Battersea Park like mushrooms after the rain. Transportation changes are part of the story. Thames bridge on approach to Victoria. Look at all the new building underway. Looking south from Victoria toward Battersea Park. Here the background is the subject. In London little remains unchanged for long. Even the train companies play musical chairs with the franchises every few years. 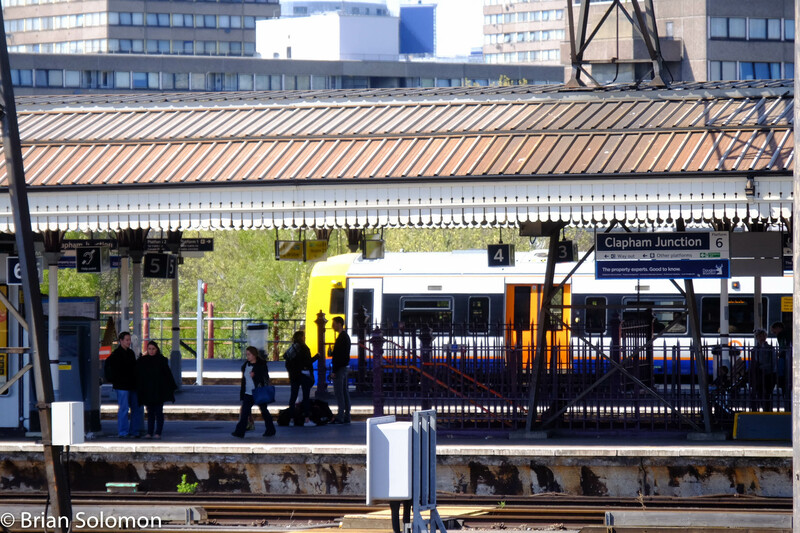 How much longer will South West Trains serve Clapham Junction? A view south of Clapham Junction Station. A South West Trains emu clatters along south of Clapham Junction. 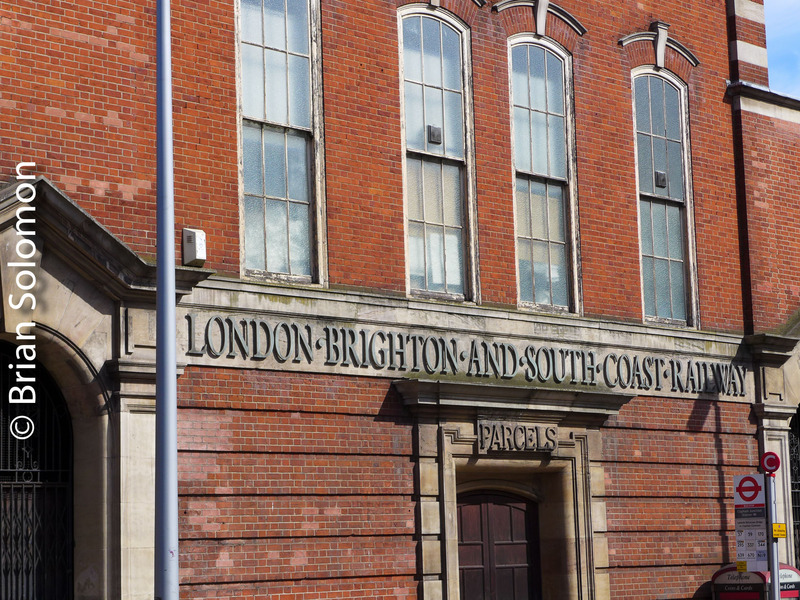 It’s been a long time since the London, Brighton and South Coast was a going concern. This is part of the old station complex at Clapham Junction. London Underground‑May 2016; Ten New Photos. Tracking the Light presents new material every day! 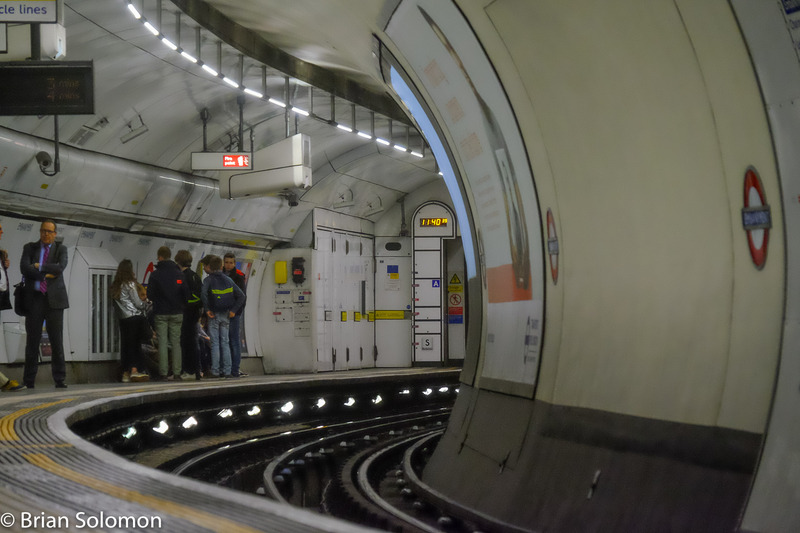 Digital photography has made photography of the London Underground vastly easier than with film. ISO 400 too slow? Notch it up to 1000, or 1600, or higher. In the old days with film I’d rarely experiment with any lens longer than 100mm underground. Not only were my longer lenses relatively slow, but trying to keep them steady at low shutter speeds was impractical. Today, I push up the ISO and snap away. The adjustable rear screen on my FujiFilm X-T1 is a great tool for photographing from the hip. Back in the old days, I’d take the prism off my Nikon F3T for a similar technique, but this made focusing difficult. I made these photos in Early May 2016. For me the Underground is more than just photos of the trains and tunnels. Lumix LX7 photo at West Brompton. Telephoto view at Embankment with my Fuji X-T1. I like a bit of subtle humor or irony in my photos. FujiFilm X-T1 photo. FujiFilm X-T1 photo. Auto white balance is a blessing when working with artificial light. View of the Circle Line at Embankment. Some of the Tube is well below the surface. Bond Street Station at Oxford Street. British Railway’s HST 40 years on. It’s been more than 40 years since British Railway’s HST (High Speed Train) made its commercial debut. These comfortable diesel powered 125mph push-push train-sets have worked intercity services on a variety of routes ever since. Today they are one of the few types of 1970s-era equipment surviving in regular traffic in the United Kingdom. HST at Reading on the old Great Western Railway route from Paddington. Trailing view of an HST Class 43 locomotive power car at Reading. All HST sets work with Class 43 diesels at each end with Mark3 carriages between. Evening view of an HST at Reading. Exposed with my Lumix LX7. Rebuilt HST sets continue to serve several private operators in Britain. Earlier this month, I traveled on HSTs with my father, and made several opportunities to photograph the trains in some of their most recent paint liveries. In the shadow of Mallard; a Virgin HST idles at London’s Kings Cross on 3 May 2016. Lumix LX7 photo. Capturing a bit of History. London’s termini are fascinating places to make photographs. A constant parade of trains and continual bustle of urban activity combined with a blend of classic and modern architecture allow for endless visual opportunity and juxtapositions. In July 2000, I was photographing at Victoria while waiting for a friend to arrive. I made this view from the steps that lead to an elevated shopping area above the platforms. A view of Victoria Station in July 2000, preserved on Fujichrome Sensia using a Nikon N90S with 24mm AF lens. What caught my eye were the antique slam door carriages that were slated to soon be withdrawn. These commuter cars had doors for each set of seats that allowed for rapid loading and unloading at busy stations, yet required passengers to open and close doors using an outside handle reached through a window. While the essential door design had been a standard feature for generations of British trains, the modern health and safety regime in the United Kingdom frowned upon such primitive appliances and discouraged their continued use. It was only a matter of time before scenes like this one would be history. 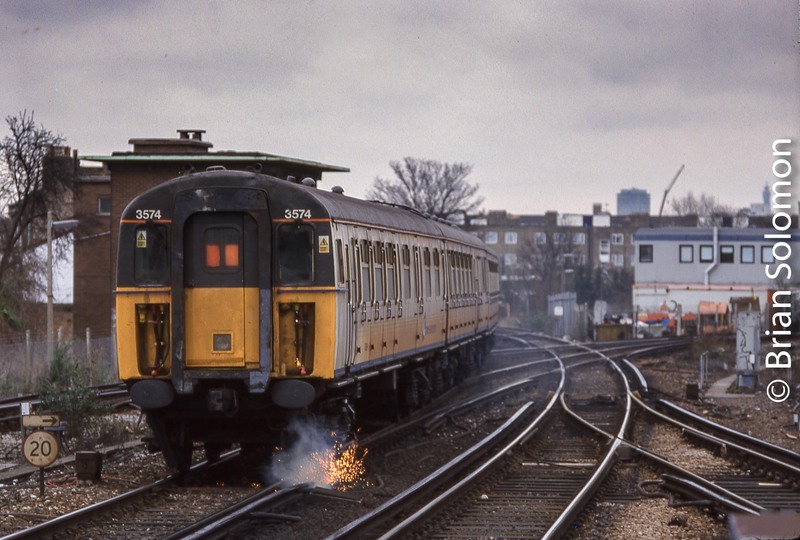 As it turned out, the classic “slam door” BR era electric multiple units out-lasted ill fated train operator Connex South Eastern. In 2003, Connex lost the South Eastern Passenger Rail Franchise (that served some routes to Victoria among other London termini). The revolving door of British railway franchises makes for a seemingly unending tapestry of modern railway names. The days of Connex’s London operations have been largely forgotten, yet some of the old BR slam door EMUs have been preserved. I saw some at Clapham Junction on a visit in July 2013. Tomorrow: Dublin station lit for Paddy’s Day. Visions of Ultra Modern Rail Transport. London’s Docklands Light Railway is a rolling example of modern artistic design. Lumix LX3 photo. Last week (July 2013), I made a visit to the Dockland Light Railway (DLR) on my urban exploration of London. DLR appears as the manifestation of a future vision. What I mean is that, it seem like the sort of ‘futuristic’ transport envisioned in the 1940s or 1950s. In many places the trains run on purpose-built elevated structures while serving spacious modern stations. Docklands Light Railway trains pass near Canary Wharf in July 2013. Lumix LX3 photo. Most remarkable is its driverless automated operation. In this regard it’s more like an airport monorail than conventional urban rail transport. Except that it has several routes that meet with complicated flying junctions and dozens of stations. Perhaps the best part of the DLR is the ability to watch out of the front of the trains as they roll along. Going west toward Bank/Tower Gateway the DLR runs adjacent to the suburban line to Fenchurch Street operated by C2C. 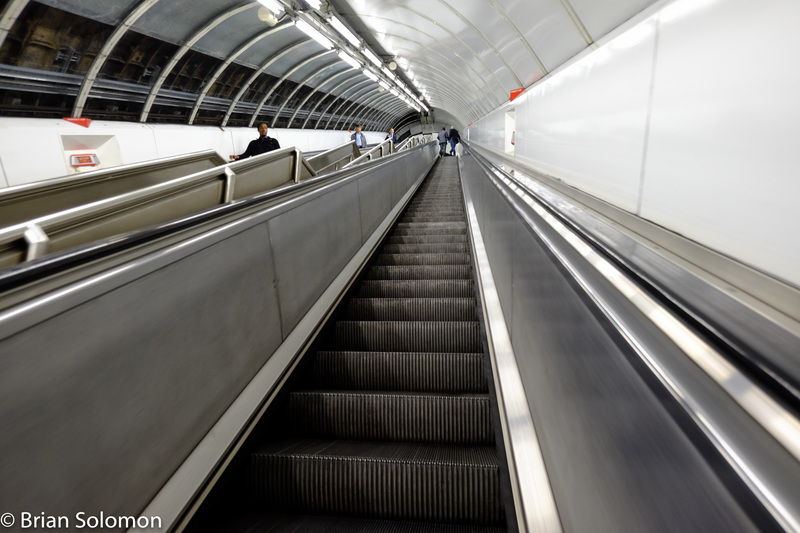 I made this selection of DLR photos with my Lumix LX3. DLR train at Canary Wharf in July 2013. View from the front of a DLR train bound for Bank. Lumix LX3 photo. 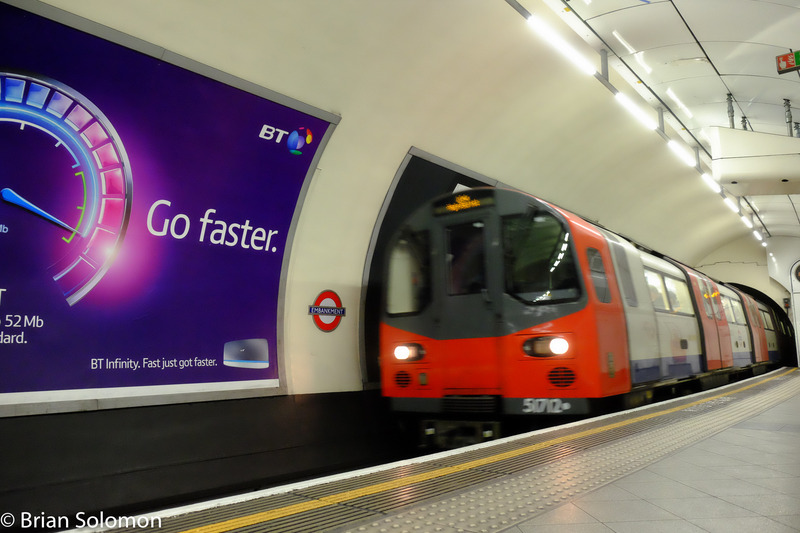 Transport – an Olympic legacy? Fast train delayed because of a suspected points failure. On Monday, April 22, 2013, a well-known industry communications manager and I paused at an overhead bridge beyond London’s Kings Cross to watch the departure of the 1400 (2pm) East Coast train to Aberdeen. This is called the Northern Lights and features a 1970s-vintage HST, thus making it among the more interesting trains serving Kings Cross. Before it was all straightened out, there were four men dressed in orange safety clothing on the ground managing the uncooperative points. Finally, just after 1412 (2:10pm), the HST marched out of Kings Cross in parallel with another East Coast train, this one hauled by a common class 90 electric (and was probably destined for Newark Northgate). I used my Lumix LX3 to catch the late departure of East Coast’s Northern Lights (on left) on Monday April 22, 2013. On the right is the class 90 electric with another northward train. It’s been more than 45 years since the famous Gresley-designed A4 Pacific’s worked this route. Much more than the locomotives has changed, and continues to change. The whole area around Kings Cross is a construction site. 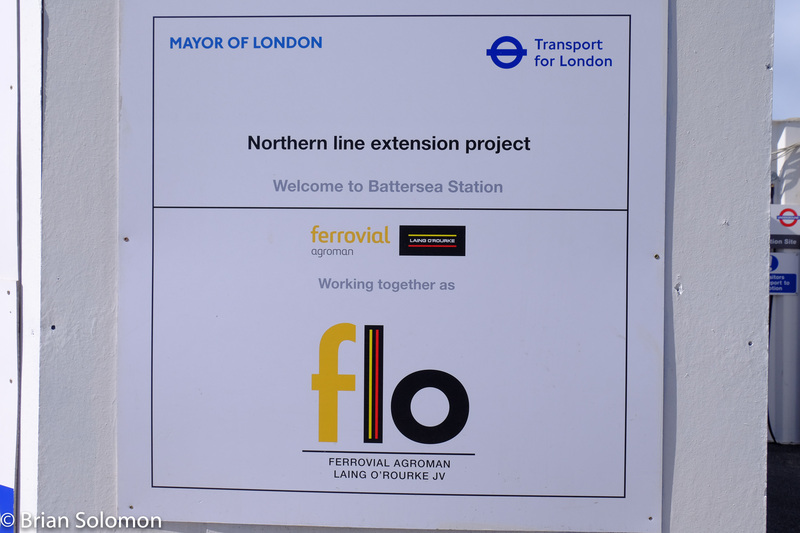 Yesterday’s post (London Overground–Part 1 posted April 27, 2013) offered a cursory survey of London’s Overground network. Here I’ve posted a follow up with more images. London Overground Train. Exposed with a Lumix LX3. 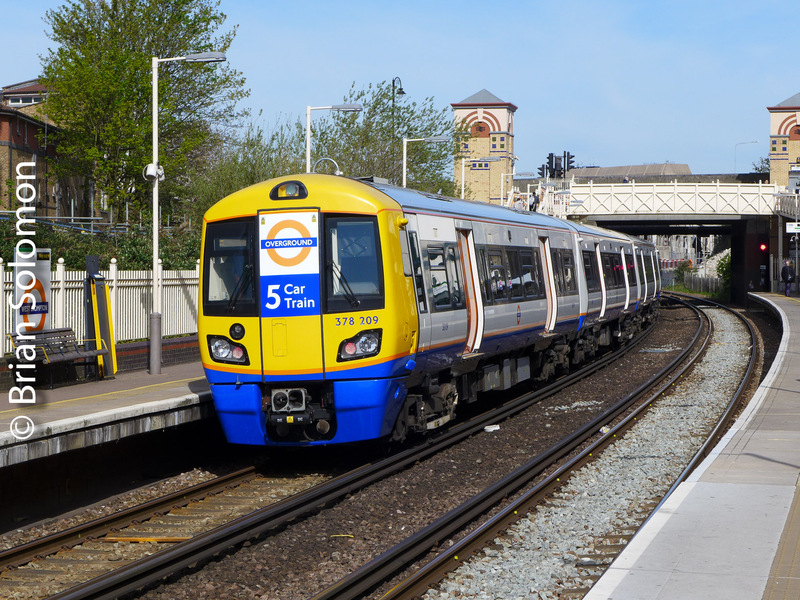 Overground train approaches Brondesbury on April 19, 2013. Lumix LX3 photo. 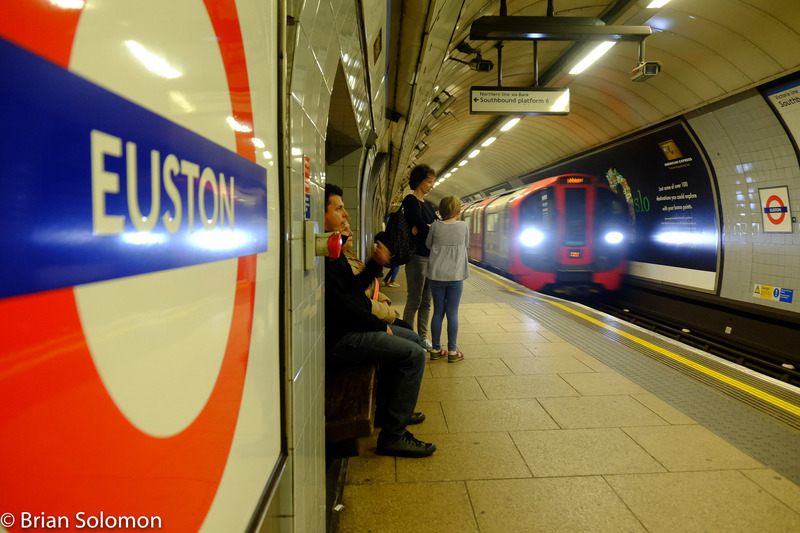 Since Overground primarily serves neighborhoods in London’s outer reaches and is a much more recent addition to London Transport, it is undoubtedly less-familiar to visitors than the Underground. 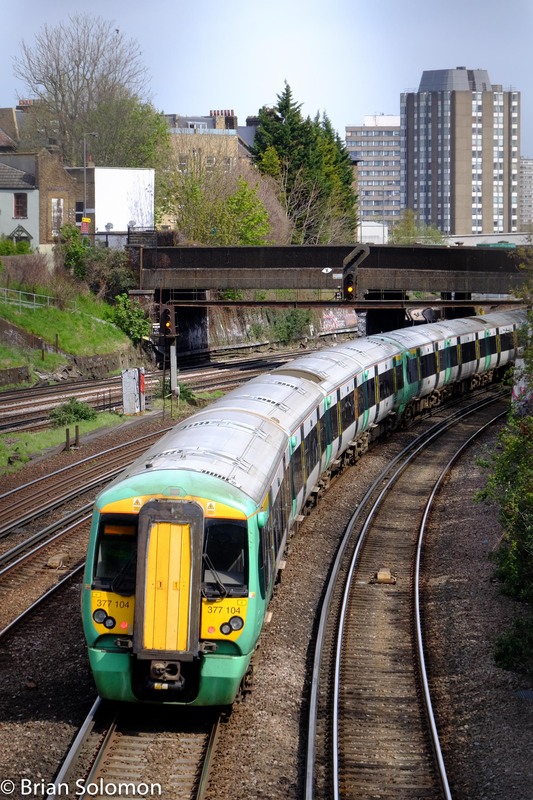 Yet, Overground is a boon for the railway enthusiast, since it connects a variety of interesting railway hubs and junctions. Overground crossing the Regents Canal at Haggerston on April 17, 2013. Lumix LX3 photo. Interior of London Overground train on April 21, 2013. Lumix LX3 photo. 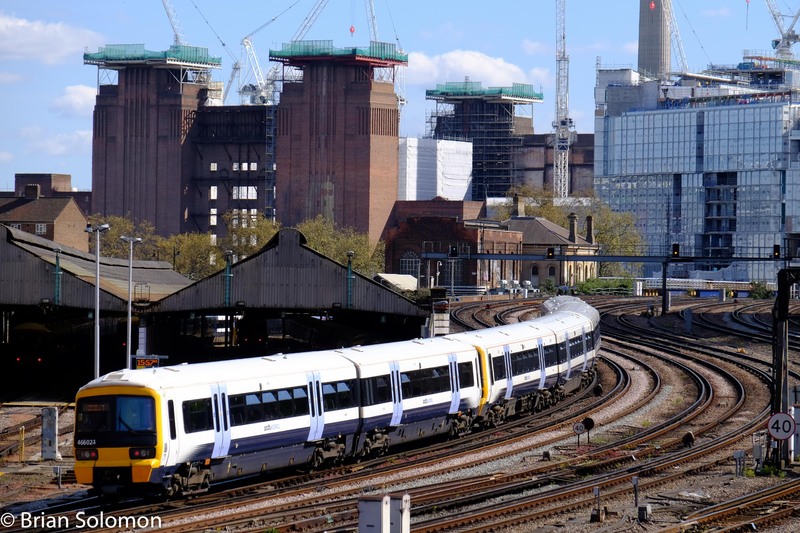 Overground services are fully integrated with other elements of London Transport, and there are many places allowing cross platform transfers to Underground and Network Rail services, as well as connections to buses and the Docklands Light Railway. 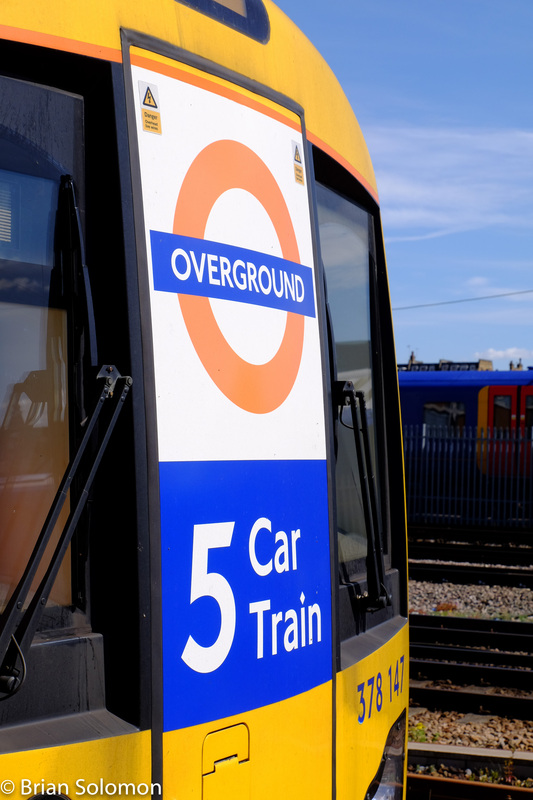 Overground is open to holders of Day Travel Cards, Oyster Cards and other urban fares. An EMD-built Class 59 diesel leads an empty stone train through Kensington-Olympia station on April 19, 2013. The Overground offers a convenient link to freight routes. Exposed with a Canon EOS 7D and 28-135mm lens. 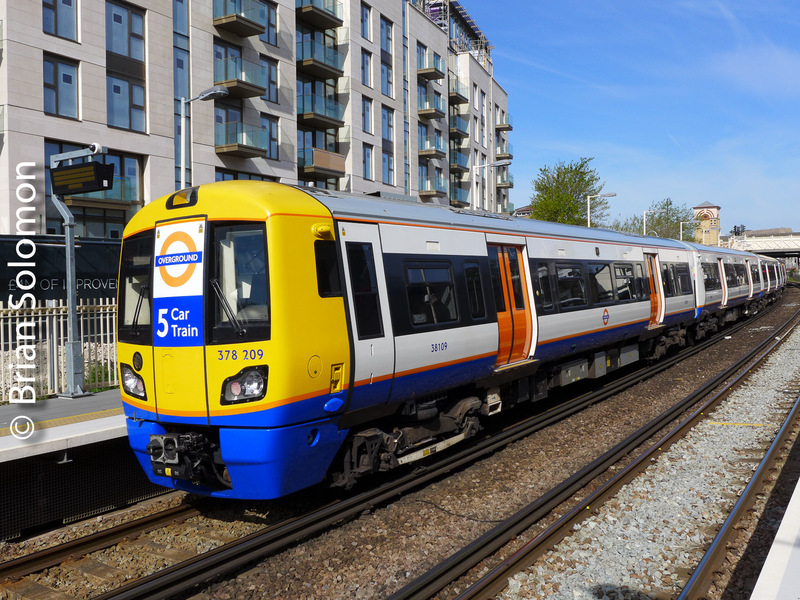 London Overground train approaches West Hempstead station on April 19, 2013. Canon EOS 7D with 28-135mm lens set at 135mm. London Overground train at Clapham Junction. Lumix LX3 photo. On the down side, many Overground stations suffer from austere, utilitarian, and otherwise uninspired architecture (if the term can be applied to the line’s platforms and shelters). Yet, I found the services well run, and stations and trains clean and easy places to make photographs. An EWS Class 66 diesel leads a northward container train through the Overground station at Wandsworth Road on April 22, 2013. Canon EOS 7D photo. Wandsworh Road on April 22, 2013. Lumix LX3 photo. A platform mirror catches a view of an Overground train at Willesden Junction on April 19, 2013. Lumix LX-3 photo. Hoxton Station on London’s Overground. Lumix LX3. London Overground platforms at Clapham Junction. Lumix LX-3 photo. London’s Overground system provides a regular-interval rapid transit service on various radial railway routes. These routes utilize a mix of Network Rail mainlines, new specialized Overground lines, and lines converted from former Underground lines. 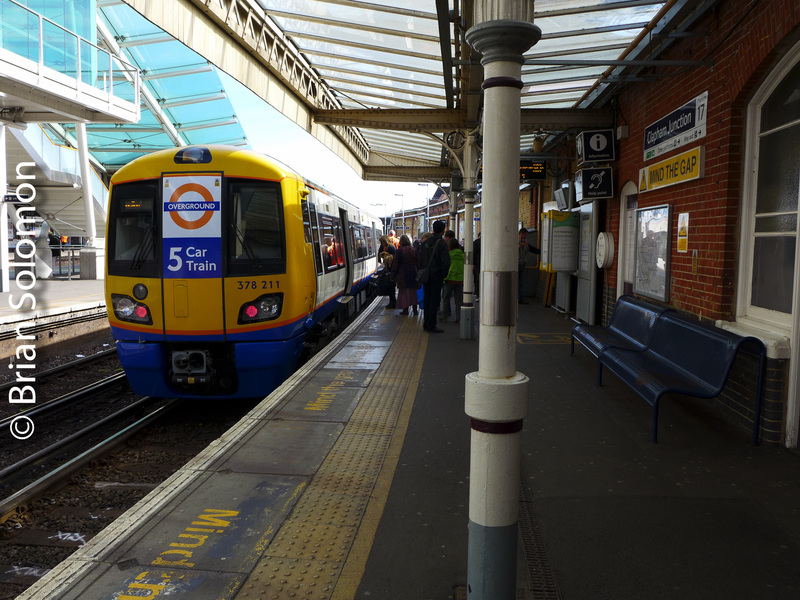 Over much of its network, Overground services share tracks with franchise long-distance passenger train operators, freight services, and in a few places with Underground trains. London Overground train approaches Wandsworth Road on its run from Clapham Junction to Highbury&Islington on April 17, 2013. Exposed with Canon EOS 7D. Recently, Overground completed an outer orbital ring. This allows passengers to make a complete circle around London (albeit requiring a couple train changes). Since this circle intersects several significant freight lines, I found it useful for studying and photographing freight trains in the London area. Overground provides an easy link from popular places to photograph freights such as Kensington-Olympia, Wandsworth Road, and a variety of stations on the North London line. My experience on this most recent trip produced mixed results. An Overground train approaches Hamstead Heath on the North London Line. Freights often use this line, filling paths between scheduled Overground services. Lumix LX-3 photo. 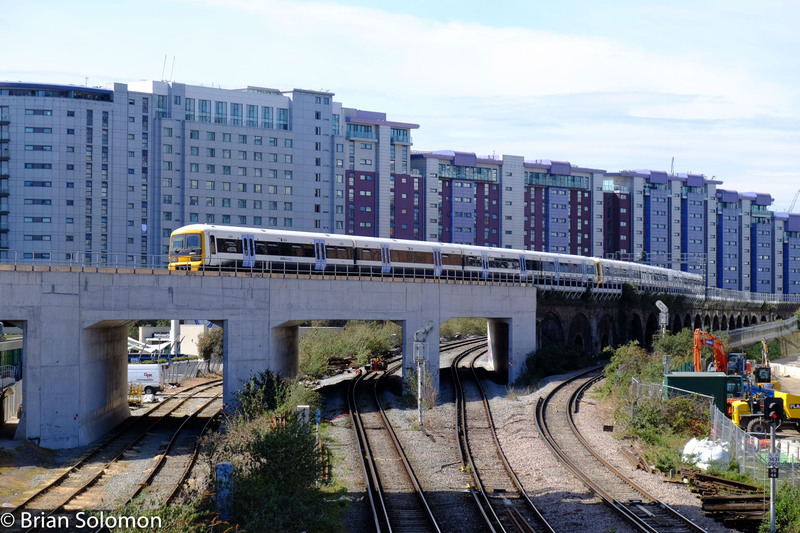 GB Railfreight EMD-built Class 66 diesels roll toward London’s Kensington-Olympia station on April 19, 2013. Exposed digitally with a Canon EOS 7D with 28-135mm lens. An EWS Class 66 diesel leads a Class 92 electric on a unit freight at Kensington-Olympia on April 19, 2013. The high volume of freight transiting London on this line, make Kensington-Olympia popular with photographers. While photographer’s lunch droppings make the station popular with pigeons. Canon EOS 7D with 28-135mm lens. Trailing view of a freight led by an EWS Class 66 diesel and Class 92 electric on a unit freight at Kensington-Olympia on April 19, 2013. Canon EOS 7D with 28-135mm lens. 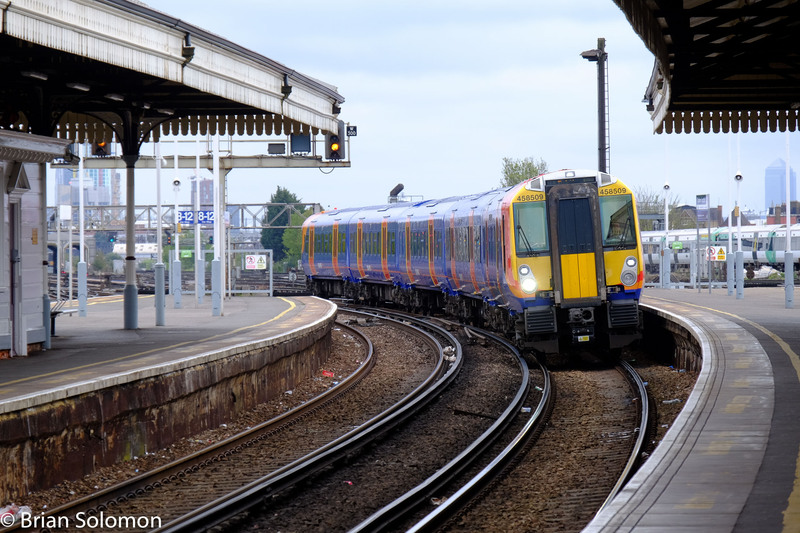 Since, Overground services have been much expanded since my last visit, I focused my efforts on riding and photographing routes that not previously experienced while re-exploring places I hadn’t visited in several years. As result, I wasn’t as patient waiting for freights to pass. While I saw many freights from the windows of Overground trains, I made only a few successful images of freight movements. My time in London was limited and I had variety of social and business engagements. Also, I visited a variety of London’s museums, pubs, and other attractions. Yet, I made good use of my time on the Overground. These are images are just a few of my results. Check London Overground—Part 2 for more views. A London Overground train at Willesden Junction on April 19, 2013. Compare this view with the image of the London Tube train presented in London Underground Part 2. Digital Images of Urban Transport. Caledonian Road Tube Station on the London‘s Piccadilly Line, April 19, 2013. 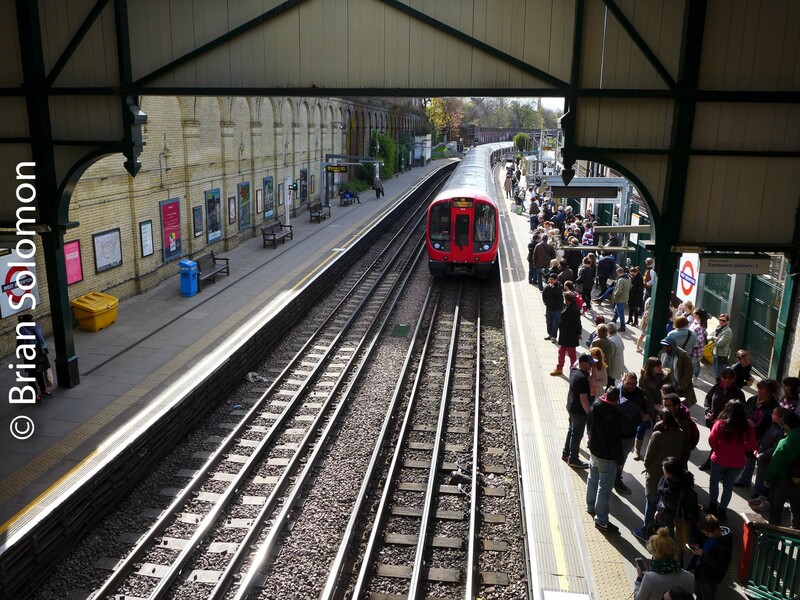 During 2013, London’s Underground network has been celebrating 150 years of service. This milestone is marked by posters and artwork around the network. For me the Underground is both a convenience and a subject for photography. London Transport Poster celebrating 150 years of service on the Underground. Lumix LX-3 photo, exposed at Bank station on Sunday April 21, 2013. 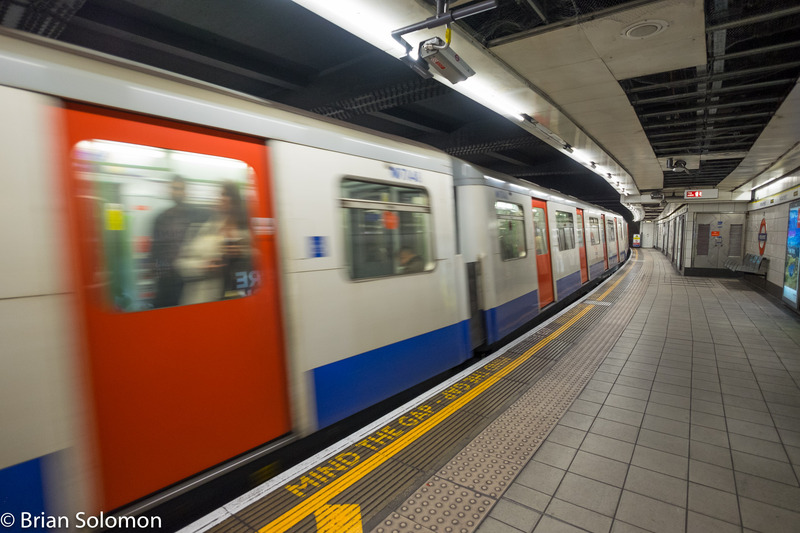 The Underground is one of the world’s most complex and extensive railway rapid transit networks, and is well integrated with the rest of London transport. 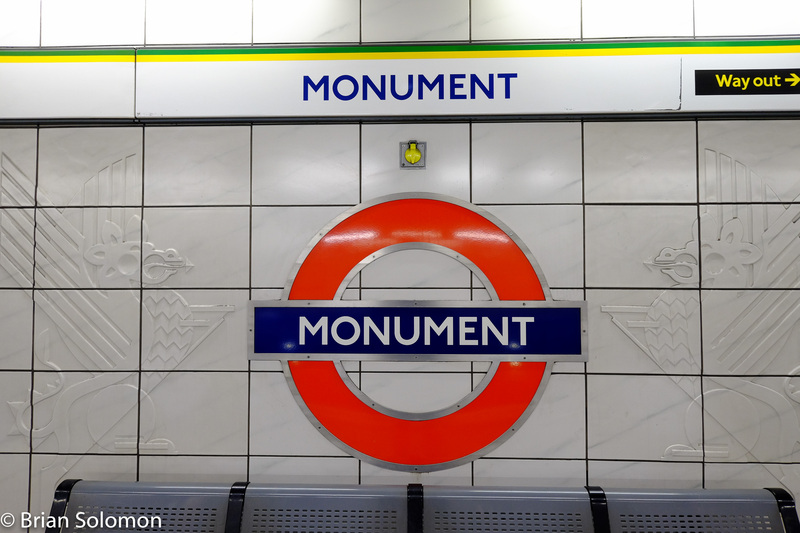 Photographing on the Underground has its challenges. Space is often constrained, it tends to be dimly lit underground, and trains and platforms are nearly always crowded. The system boasts that it carries more than 1 Billion passengers annually! At times it seems that each and every one of these billion are in the way. Yet, the passengers are the reason for the system and often make for the most interesting images. 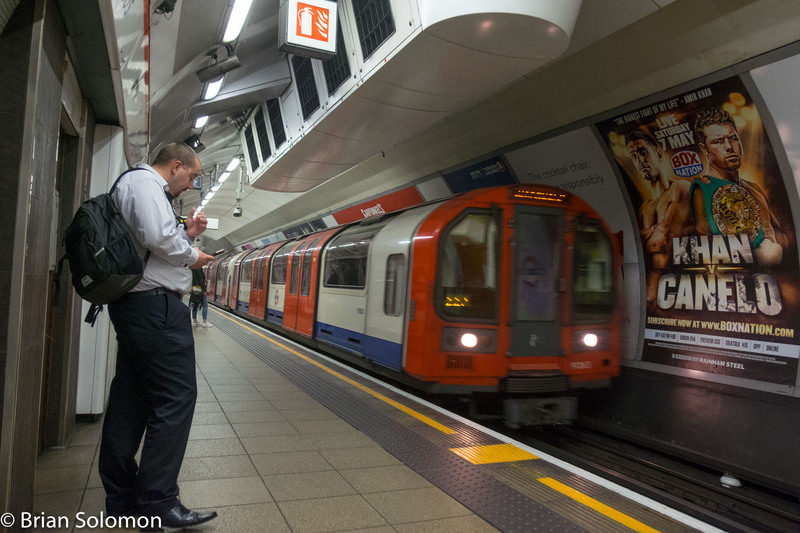 I’ve included a small selection of photos of the London Underground that I exposed over the last week. Most were made with my Lumix LX-3, which owing to its compact size and ease of use makes it my choice camera for making Underground images. Use of flash is prohibited; a tripod is impractical, so all of my images were made handheld with existing light. Highbury&Islington Tube Station on the Piccadilly Line, April 19, 2013. 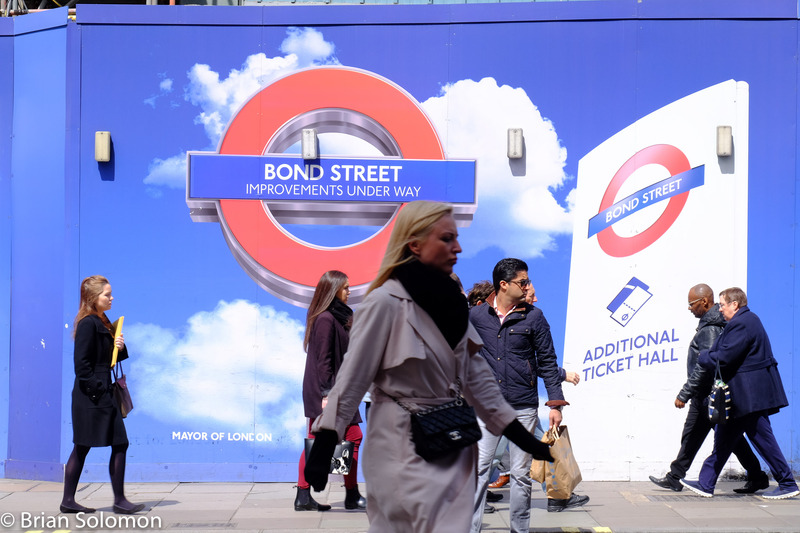 London Underground Station at Leicester Square on April 22, 2013. Classic Underground mosiac on the wall of the Tube. Lumix LX-3 photo. Escalator at Leicester Square Tube Station. The View From Wandsworth Road Station Footbridge. Perhaps London’s most impressive railway backdrop is the disused Battersea Park Power Station. It is among London’s industrial icons and famous for its portrayal on the cover of Pink Floyd’s 1977-album Animals. 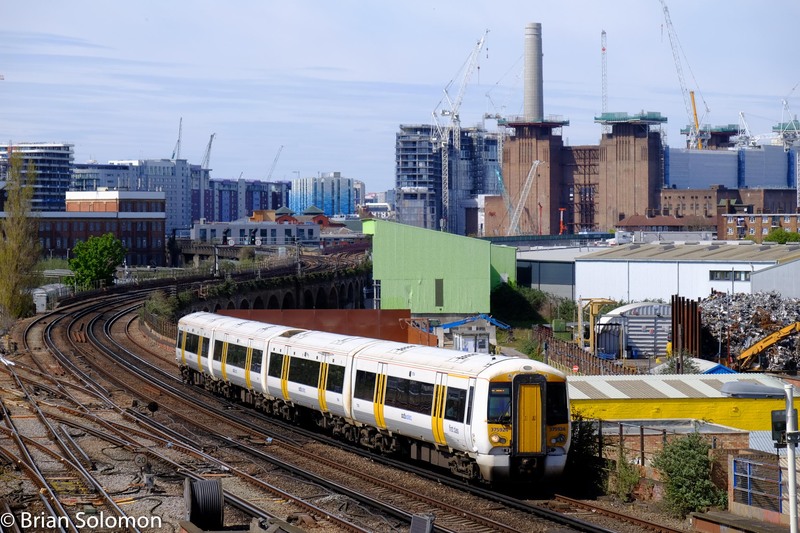 A Southeast Trains EMU from Waterloo Station passes the Battersea Park Power Station on April 17, 2013. Exposed with a Canon EOS 7D fitted with 28-135mm lens. This location was recommended to me from veterans of railway photography and I first photographed here in the year 2000. The vantage point is from the lightly used suburban station at Wandsworth Road. 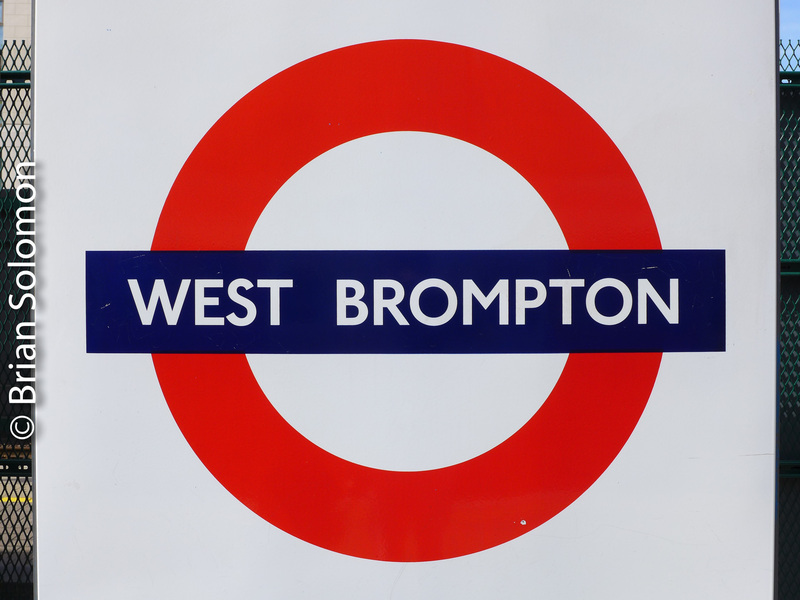 Until recently, this was served by a loop service connecting London Victoria and London Bridge terminals. Now, the Overground rail network (subject of a future post) serves Wandsworth road. Trains stop here every 15 minutes on the run between Clapham Junction and Highbury&Islington stations. Several lines converge at Wandsworth Road, and in addition to continual parade of suburban trains are a variety of freight moves. Until a few years ago, Eurostar high-speed trains passed on their way to and from Waterloo International. 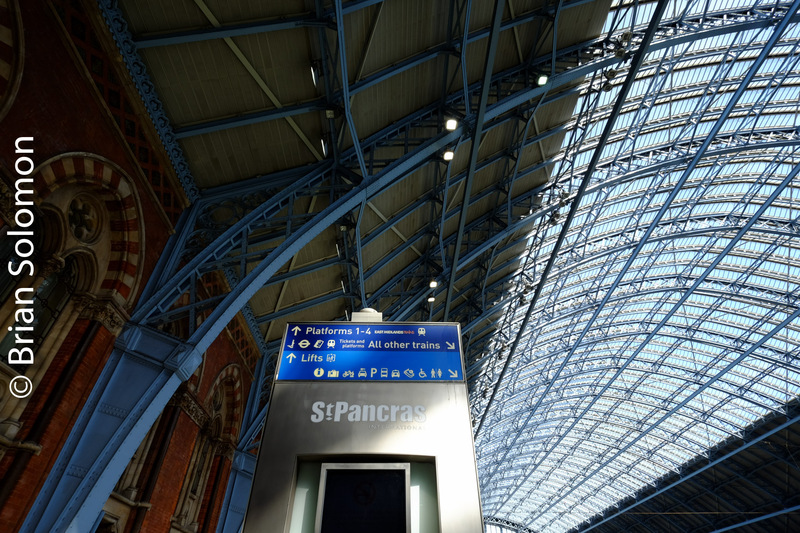 Now, Eurostar serves St. Pancras and take a different route through London. 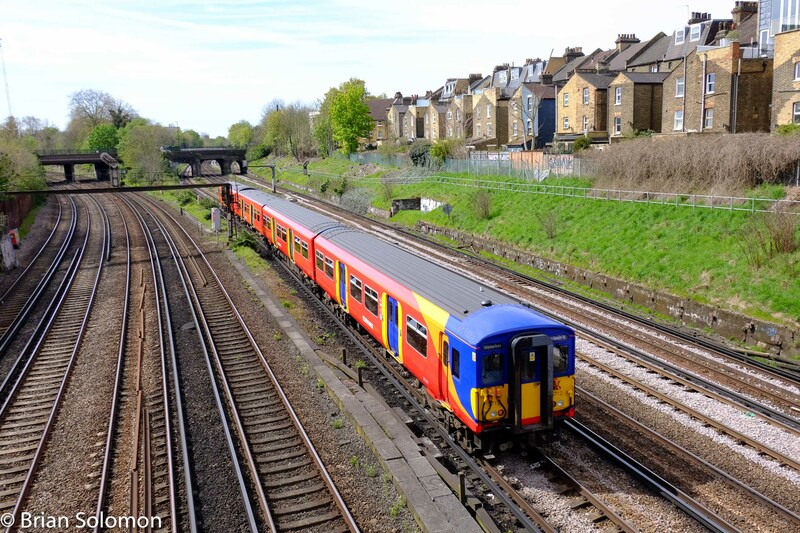 Southeast Trains services glide along at Wandsworth Road, London on April 17, 2013. Digital image made with a Canon EOS 7D fitted with 28-135mm lens. I made these images only an hour or so after landing at Heathrow. As I waited for trains, helicopters were circling as result of on-going funeral proceedings for Margaret Thatcher. 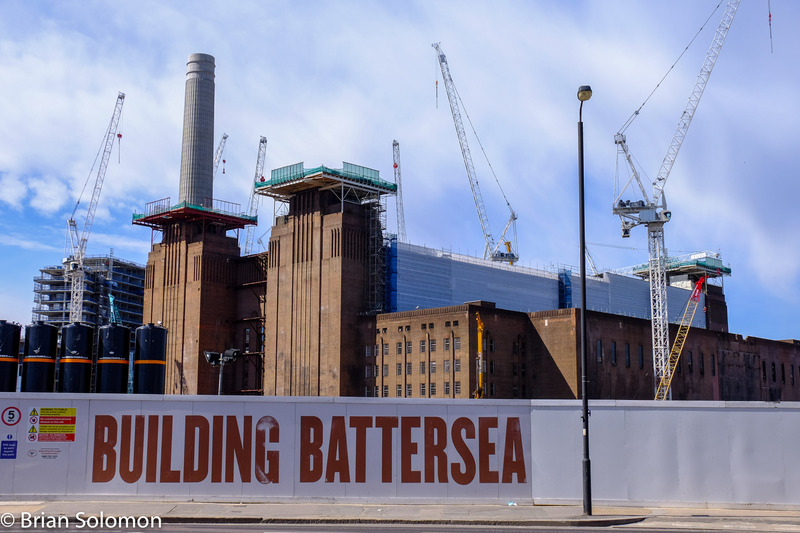 Battersea closed as a generating station in 1983; ironic, isn’t it? Battersea Park Power Station on April 17, 2013. St. Pancras Station on Thursday, April 18, 2013. I first visited London more than 15 years ago and since that time, I’ve revisited this dynamic city dozens of times. The impetus for last week’s visit was the opportunity to give an illustrated talk to the London-area Irish Railway Record Society. I made this image of St Pancras on my way to the talk, which was hosted at the Exmouth Arms near London’s Euston Station. This magnificent structure is one of several important railway terminals along Euston Road. 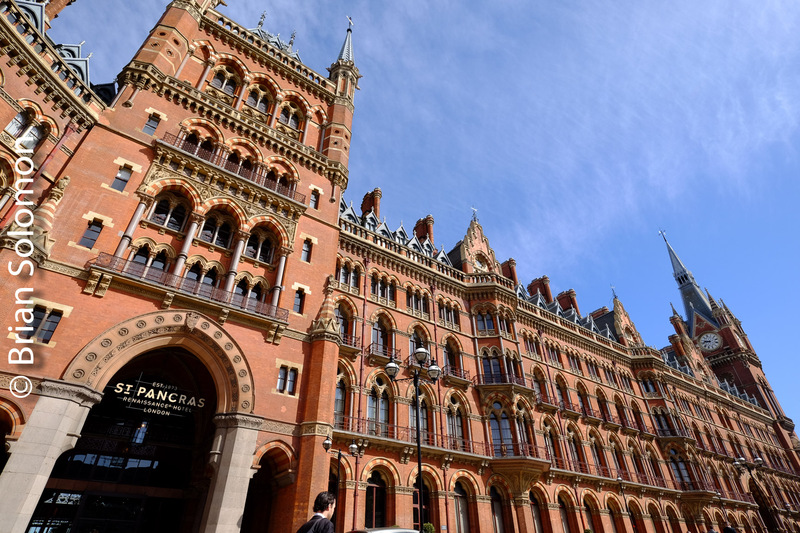 The massive ornate building was designed by Sir George Gilbert Scott, and historically served as both the St. Pancras head house and the Midland Grand Hotel. 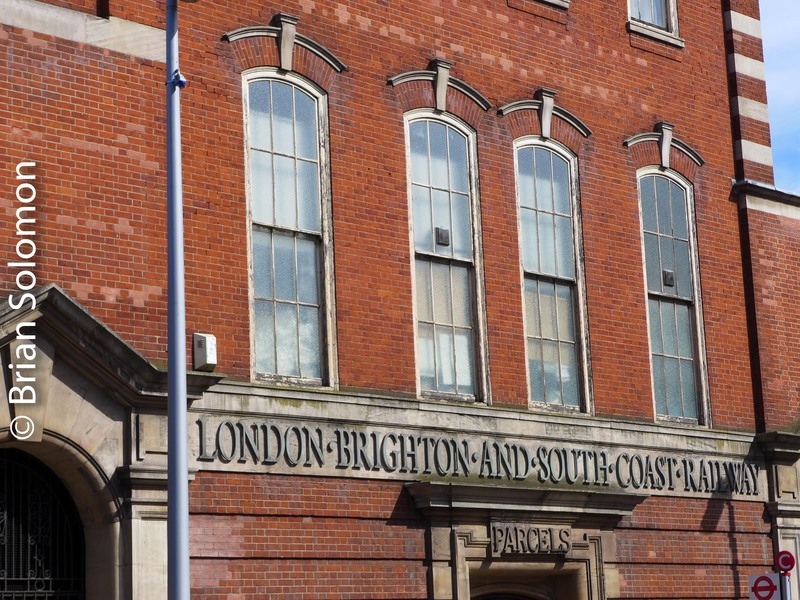 It remains one of London’s finest railway buildings. 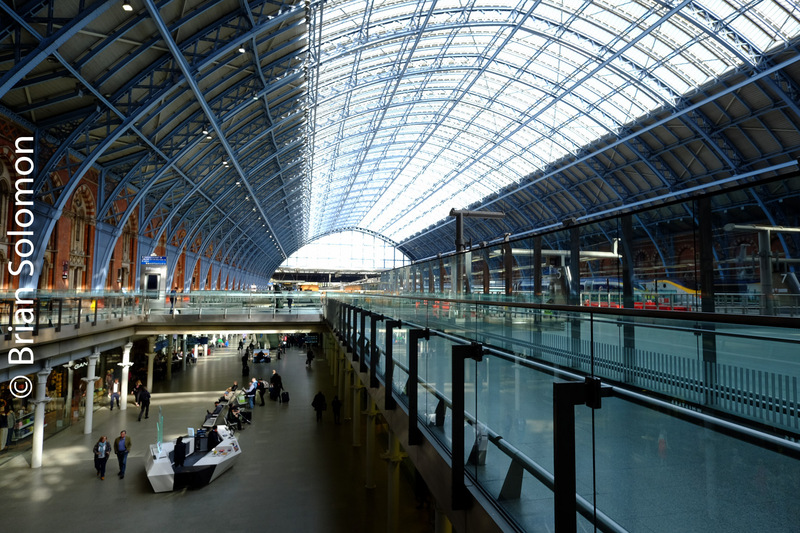 Beyond the head house is St Pancras’ immense balloon-style iron and glass train shed—the pioneer work of this type. During my visit to London, I had the opportunity to explore the transport network. I found a variety of changes since my last trip to London, nearly two years ago. As one of the world’s great cities, London is undergoing a continual transformation. While elements of its past are incorporated in its new urban fabric, in each and every visit I find some things new and note some things forever lost. If nothing else, this keeps my cameras busy. During this trip, I exposed more than 1000 digital images, and nearly 3 rolls of slide film. I plan to explore this material over the next few posts. Stay tuned!